*Seek medical advice before using Prospan in children in under 2 years. This medicine may not be right for you. Read the warnings before purchase. These can be found in the dosage section below. Follow the directions for use. If symptoms or coughing persist, talk to your health professional. Not to be used in children under 2 years without medical advice. Food for thought: When looking for relief, it is important to understand what kind of cough you have. 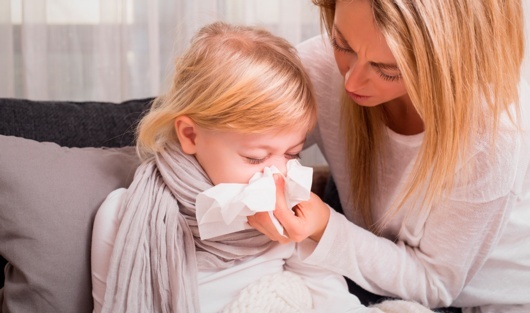 Dry coughs are non-productive and can mean having an irritated tickly throat while chesty coughs are associated with excess mucus which triggers our cough reflex to help remove the extra phlegm. When you are looking to ease a chesty cough, Prospan’s specific Ivy leaf extract EA 575 can help to thin and break up chest mucus. Prospan is non-drowsy and well tolerated in children, adults and the elderly.1 The tolerability of Prospan is based on research studies in thousands of patients and decades of use worldwide. For further information consult the FAQs section below or contact us directly. As always, it is recommended to talk to your health professional if you have any questions about using Prospan. Contains sorbitol. Products containing sorbitol may have a laxative effect or cause diarrhoea. Contains sorbates. Always read the label. Follow the directions for use. Contains sorbates. If symptoms or coughing persist, talk to your health professional. Hedera helix EA 575 extract equivalent to 43.75 mg/mL dry leaf. Natural medicines can vary considerably depending on the species of plant chosen, the way the plant is grown and harvested, and the extraction and production processes used. So it’s essential that you get the same medicine that’s demonstrated efficacy in clinical trials. My children refuse to take cough mixtures because of the taste, will this be the same? Prospan has a great tasting natural cherry flavour suitable for children – and is the world’s No.1 natural chesty cough medicine used by millions of families worldwide. Prospan is not to be used in children under 2 years without medical advice. Can Prospan be used during pregnancy and breastfeeding? Prospan is not recommended for use during pregnancy or breastfeeding as there are no published studies to establish its safe to use during pregnancy or while breastfeeding. Your healthcare professional can discuss with you the risks and benefits involved in taking Prospan during these life stages. Is Prospan likely to interact with any other medicine? There are no known reported interactions between Prospan and other medicines. As always it is recommended to talk to your healthcare professional if you have any questions about using Prospan. Can I give Prospan to children? Prospan is well tolerated by children. See packaging for appropriate children’s dosing. Prospan should not be given to infants under 2 years of age without medical advice. Does Prospan contain gluten, dairy, colours or sugar? As a natural remedy for chesty coughs, Prospan does not contain any added gluten, soy, dairy, sugar or artificial colours. Is Prospan suitable for vegetarians? Prospan is vegetarian friendly as it contains no animal derived ingredients. Prospan does not contain alcohol. Will Prospan affect the ability to drive and operate machinery? 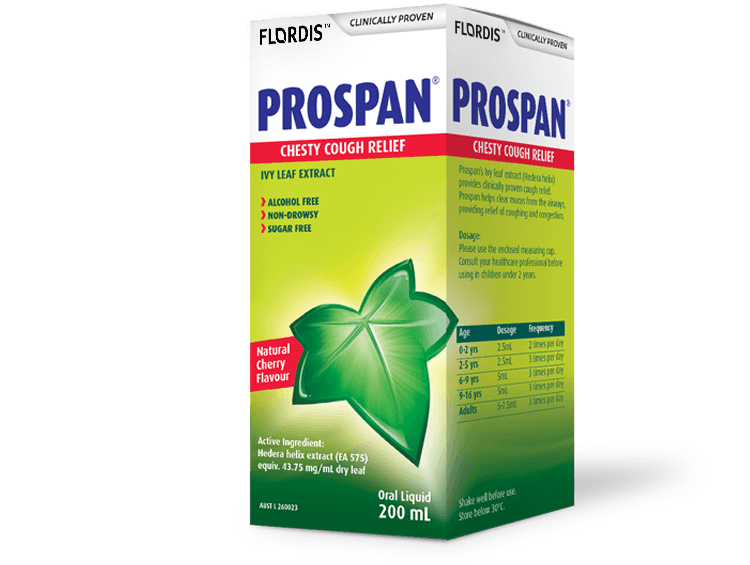 As a natural cough medicine, Prospan does not cause drowsiness and is not expected to affect your ability to drive a motor vehicle or operate heavy machinery. Where can I find Prospan? The Prospan range is available from pharmacies and selected health food stores. If you go to the ‘Find a Store’ button above and follow the instructions, you will be able to find a list of stores in your area that either stock Prospan or will know how to order it in. Runkel F, et al., Pharmazeutische Zeitung 2005; 15.04:19-25. Schlenger R., Deutsche Apotheker Zeitung 2003; 43(49) [translation].